I received two post cards from Mommy Mel’s I heart giveaway contest by sharing the link to the social medias. My prizes are these two post cards. 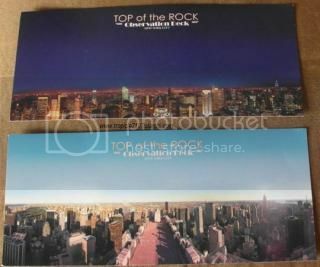 The post cards are from Top of the rock observation deck in New York City. Mommy Mel and her family visited this beautiful observation when they went to New York City. Can you believe that I am from New York yet I have not visited this place? I hope that someday I could visit this beautiful observation deck with my family. This is a beautiful sight to check especially at night. You can see how beautiful New York City is at night. I want to say thank you to Mommy Mel for my prizes. I like it this will adds to my post card collection. I know if you like to collect post card; you want to have these post cards as well. What about you? Have you been to New York City? Have you visited this observation deck? I am linking this entry to #366 of Blog Photo Challenge.